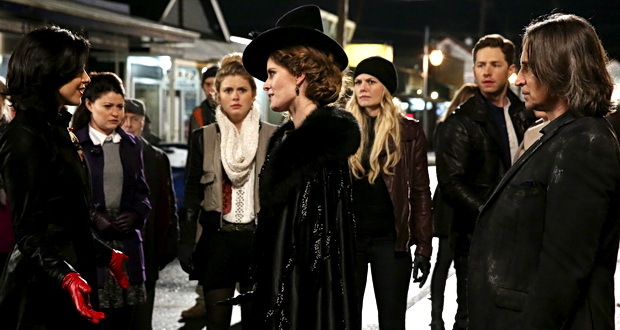 Two-Sentence Summary In Storyrbooke, Zelena’s connection to Regina is revealed, and the half-sisters face one another in a “wicked versus evil” showdown. The roots of Zelena’s envy are shown in flashbacks to her life in Oz, which she left behind when the Wizard helped her get to the Enchanted Forest to train with Rumplestiltskin. My Thoughts Once Upon a Time is at its best when the heroes of the show are united against a compelling, charismatic villain. The second half of Season Two struggled because, let’s face it, Greg and Tamara were anything but compelling villains. The introduction of Robbie Kay’s deliciously devious take on Peter Pan injected some much-needed energy into the start of Season Three, and one of the most pleasant surprises of this half of the third season has been how fabulously fun Rebecca Mader’s Zelena has been. It’s no secret that some of the show’s best moments feature its villains (or anti-heroes or whatever they would like to be known as) sharing scenes together, chewing the scenery in a way that is both perfectly campy and utterly captivating. So it shouldn’t surprise anyone that the combinations of Zelena and Rumplestiltskin and Zelena and Regina drove this episode. It’s always fun watching Lana Parrilla and Robert Carlyle have so much fun with their characters, and I can now say the same for Mader. The Wicked Witch’s origin story wasn’t sympathetic enough to make me want happiness for her despite her wickedness, and I’m happy for that. I understood her, but I still think her envy is rooted in something more pathological than a sympathetic backstory can explain. And that’s okay. I don’t think we’re supposed to feel a lot of sympathy for Zelena. Yes, she had an alcoholic adoptive father and was abandoned by her real mother, but she seemed to live a life of love until her adoptive mother died. Whereas Regina lived with an abusive, literally heartless mother and a father who never seemed to defend her from Cora’s wrath. I know we have the benefit of knowing all the facts Zelena’s envy has blinded her from seeing, but I think Regina is the one who got the worse end of that deal. What interested me the most about Zelena in this episode was how much more like Cora she was than Regina ever was, despite Regina being the one to grow up with their mother. Both Zelena and Cora grew up poor, and that gave both women a sense of envy and lust for a better life that Regina never had (which is a nice twist on the idea that the original Evil Queen in the Snow White story was driven by her envy of Snow White, and that was never the case on this show). Zelena had more control over her magic than Regina, and I think much of that difference can be attributed to the fact that Regina saw the evil in her mother’s magic and wanted no part of it for many years, while Zelena never had that exposure to dark magic being used to hurt her. Another cool parallel to draw between Zelena and her mother is their relationship to Rumplestiltskin. Both women were attracted to his power and his ability to teach them how to wield their own power. Mader’s chemistry with Carlyle in the scene where he blindfolded her in the woods was just the right mixture of electric and unsettling—much like Rose McGowan’s was in Season Two’s “The Miller’s Daughter.” Regina, however, never showed any signs of being attracted to Rumplestiltskin. It’s what made her the ideal candidate to cast the Dark Curse, a task that became a one-sided competition for Zelena. I had to laugh at the ridiculous levels of imagined sibling rivalry happening in Zelena’s head throughout this episode. From wearing Regina’s clothes again to actually wanting to cast the Dark Curse just to prove she was more worthy than Regina, Zelena’s delusion was as disturbing as it was entertaining. And what made it even worse was the way Rumplestiltskin preyed on it. He took two women and manipulated them in very specific ways to get him what he wanted, and I had to admit that I got a perverse kind of pleasure from Zelena’s revelation that her silver slippers (excellent book reference, Once Upon a Time writers!) could have taken him where he wanted to go without the Dark Curse. While Zelena’s motivation for hating Regina seemed misplaced (kind of like Regina’s motivation for hating Snow—both women should place that blame on their mother), I now totally understand her desire to control Rumplestiltskin after feeling like she was under his spell while in the Enchanted Forest. Zelena and Regina’s showdown ultimately felt a little anticlimactic, but the real relationship at the heart of this episode was the one between Zelena and Rumplestiltskin. It’s what made every moment Carlyle was onscreen in this episode so heartbreaking. You could see how desperately he wanted to break free from her control, but there was a horrible sense of resignation there, too. It was especially evident in the reunion he had with Belle in his cage. Seeing Zelena’s attraction to Rumplestiltskin in the flashbacks made her voyeurism even creepier in hindsight, and it killed me to watch the manifestation of the idea that some curses are too strong for even true love to break. Zelena’s emotional torturing of Rumplestiltskin was evident right from the beginning of the episode, with each shovelful of dirt hitting Neal’s casket acting like a blow to him (which was beautifully shot by director Mario Van Peebles). Hearing Rumplestiltskin say that all of the years he spent planning to get back to his son were worth it despite the short amount of time he spent with Neal was the most beautiful eulogy imaginable for the character. It nicely complimented the idea that Neal’s arc was about his father and his son, since his father was a prominent part of his funeral scene (even if he wasn’t technically there) and his son was the only one with a storyline really focused on mourning his loss (even if Henry doesn’t remember him). Rumplestiltskin’s heart was with his son, even while his mind was controlled by Zelena. That was the central theme of this episode—characters choosing to give their hearts to someone (both literally and figuratively). Zelena gave Rumplestiltskin her heart right away, and we all saw how that choice turned out. However, Emma and Regina seem to have found more worthy and more sincere men to give their hearts to. Emma’s heart is Henry; her love for her son was the only love true and strong enough to break the Dark Curse. So it’s no small thing that she trusted Hook to help Henry’s own heart heal after his father’s death. It’s one thing to trust Leroy to physically take care of Henry while she’s off searching for Zelena. It’s another thing entirely to trust Hook to help Henry deal with his father’s death in a way she can’t. Emma and Hook’s scene at Granny’s diner was one of my favorite scenes in “It’s Not Easy Being Green” because it was another moment of character development beyond attraction and romance; it was a moment of two people confiding in each other and revealing new parts of themselves to each other in a way that felt natural—and with just the right amount of sexual tension to heighten the moment but not detract from it. Hook telling Emma not to resort to vengeance was basically a neon sign flashing “character growth” over his head. It was another reminder that Hook didn’t give up his quest for vengeance because of Emma; he gave it up because it left him feeling empty. And he needed Emma to know that because he knows the darkness it can bring to a soul—a darkness he doesn’t want Emma to experience. But Emma is a woman of action, and right now she feels taking action against Zelena is the only way to help Henry. When she told Hook that she didn’t know another way to help her son, Jennifer Morrison put such helplessness into her voice that I was floored by how much Emma revealed to Hook in that brief moment. It takes a lot for anyone—especially someone who defines herself by her role as parent—to admit that she can’t help her child the way she wants to. And Hook understands this because he understands her. His offer to tell Henry what Bae was like came from such a sincere place that it made me emotional. I loved that this wasn’t about Emma at all; this offer was about helping Bae’s little boy and finding his own way to honor and mourn Bae. Emma’s stunned reaction was as beautiful as it was heartbreaking. Morrison does such a great job of reminding us in subtle ways that Emma is still not used to people being sincerely kind to her; she’s not used to people—especially men—pleasantly surprising her. But that’s what Hook keeps doing. His gesture of helping her son—and his promise to protect him—mean more to Emma than any traditionally romantic gesture. Morrison painted a convincing picture of a woman truly touched by someone who continues to prove himself to be different than who she thought he was—and for the first time in her life, it’s for the better. I was so happy that Hook and Henry’s scene on the beach didn’t turn into a “Do you like my mom?” conversation. This wasn’t the place for that. This was the place for two lost boys to mourn another lost boy. Colin O’Donoghue is really great with young actors; he was phenomenal with the actor who played young Bae, and he was excellent again with Jared Gilmore. When Hook explained to Henry that the young man and his father had things in common, I wanted to cry at the hopeful and grateful look on Gilmore’s face. You could see the lost boy in Henry reaching out to the one in Hook. O’Donoghue made it clear that this was the moment Hook decided that Henry deserved more than a life of false memories in New York; he deserves a chance to be with his family, and Hook began to hope that he could be a part of that family—not just because he cares for Emma but because he’s come to care for Henry, too. The direction in the last scene between Hook and Emma at Granny’s was gorgeous and made the tension and developing intimacy between them so clear. Emma’s heartfelt words of gratitude were beautifully delivered by Morrison; you could feel her defenses starting to crumble and her affection starting to make itself clear. But Hook needed to tell her about her son; Henry was more important than anything else for him in that moment. So he told Emma the hard truth: She can’t expect to take Henry back to New York and pretend this never happened. It’s not fair to Henry, and it’s not fair to those in Storybrooke who love him. The fact that Hook felt he could be this honest with Emma speaks to the trust between them; not even her father would tell her that her “return to NYC” plan is misguided. And once again, Emma’s walls went back up. Hook hit a nerve, and he knew it. But he also knew it was something she needed to hear, even if she didn’t want to hear it. The slow development and stops and starts between Hook and Emma in this episode were contrasted with the rapid-fire development between Regina and Robin Hood. At first, I thought things progressed a little too quickly from flirting and emotional honesty to literally giving your heart to someone, but then I remembered a huge difference between Emma and Regina: Regina is still a woman from the Enchanted Forest. Besides Belle and Rumplestiltskin, love happens quickly there. Even for a woman as afraid to love as Regina, there is a part of her that has always wanted it; she was once a romantic and a believer in true love. Her relationship with Robin is helping her find that part of herself again, and I’m enjoying watching it. Regina finding Rumplestiltskin’s letter and understanding the truth about it was devastating. The doubt that sprang from it felt so real and believable—mainly because Parrilla made it feel that way. The fact that Regina willingly opened that part of herself to Robin was a huge step for her. She chose to let him read the letter, to share her vulnerabilities with someone and trust that he wouldn’t think less of her. And he didn’t. When he read the word “stunning” and looked at her as if he were telling her that himself, I got goose bumps. I wish we could have seen more of that scene to get to the point where Regina gave him her heart for safekeeping, but Regina had a showdown to get to. I loved that her fear of losing was gone and in its place was the kind of sassy, snarky Regina that we all know and love. I could watch Parrilla and Mader sass each other for a whole hour and not get tired of it; the actual confrontation was far too short for my liking. In the end, Regina survived because she trusted her heart to Robin; giving her heart to him wasn’t something that made her weak. It made her successful. Yes, it was almost laughably literal (but when has this show ever been known for subtlety? ), and yes, I wish we knew more about Robin to feel more of an emotional impact for both sides. But I’m just happy Regina is finally making the choice to trust someone with her heart. She could have buried it in the woods alone, but she chose to trust that Robin would protect it. And she chose to have him keep it because he can’t steal what she gives him freely. That line has huge significance for their love story. True love on Once Upon a Time is about choosing to trust and choosing to be vulnerable, and Regina has grown into a woman who can make that choice instead of running from it. I’m intrigued to see if there’s a difference between taking your heart out (or having it removed) and giving it to someone else for safekeeping. I’m also intrigued by the conclusion of the episode and what it said about Zelena’s endgame. The “green with envy” twist was predictable but fit the plot well enough, and I loved the Wizard reveal; I didn’t see Walsh coming at all. (Side note: How great were the Oz special effects in general? I’d say they were some of the show’s best.) The “time traveling” twist was another I didn’t see coming, and I’m a little worried about it, if I’m being honest. It could go really well or really poorly, and I’m hoping that it’s done in a way that makes sense (or never comes to fruition at all). No matter what, if we continue to get more of the dynamics explored in this episode (and more campy fun from Mader) it’s going to be an entertaining ride. Regina giving Robin her heart was hilariously literal but I didn’t even care because of how happy Regina looked when she turned away from him. She knows who he is supposed to be to her and she’s taking a chance on trusting him instead of running away again. I’m not particularly invested in Robin as a character but I do love that Regina is opening herself up to him and the potential of happiness. I wish I found Zelena a little more compelling as a character because while I love her scenes with Rumplestiltskin and Regina, there’s something missing in her story for me to be very interested in her when she’s not with one of them. I completely agree with everything you had to say about Emma and Hook. I love that Hook’s character growth has become even more apparent and I loved everything about his interactions with Henry. There’s a gentleness to them that I would never have expected from him when we were first introduced to the character. I honestly couldn’t believe they were going that literal with Regina and Robin but it worked for me because she seemed so happy and at peace with her decision, and that’s a look I really like on Regina. She deserves to be able to choose happiness, and this is her way to do that. And I think “gentleness” is the perfect word to describe Hook’s interactions with Henry. Colin O’Donoghue gave off that same vibe with the actor who played young Bae in last season’s finale, and it was one of the things that really drew me to him as an actor and to Hook as a multidimensional character. It makes me happy to know it’s a recurring character trait for him to be so kind and warm towards kids like Henry and Bae. I have so many conflicting emotions about this episode. I liked it quite a lot, but I found it had a lot of flaws; which makes me liking it confusing. Maybe I’m a bit disappointed after all the expectations, or maybe it’s because I’m feeling a bit under the weather, but I’m having a really hard time deciding if I want to give it a thumbs up or down. I’m still waiting for the reveal of who Zelena’s father is, but overall her backstory so far was well done, if certainly predictable. Almost every villain in this story (and some of the heroes) has their roots in daddy/mummy issues. It’s starting to feel quite repetitive. Surely there’s other reasons to become a bad guy, no? It’s the same story over and over again; Rumpelstiltskin, Neal, Regina, Emma, Zelena… even Greg Mendel! My appreciation for Cora has grown tenfold for owning up to her villainous ways just because she wanted power. That said, Zelena’s story with Rumpel worked nicely because it added another layer to his character and his absolute lack of remorse when it comes to ruining other people’s lives in order achieve his final goal: get back to Baelfire. That Gold confirmed that it was ultimately worth it was a nice touch to come full circle. Robert Carlyle was perfect, Rebecca Mader was fantastic in her campiness and I can ‘t talk about Lana Parrilla without being unbiased so I’ll leave it at that. I liked Hook quite a lot in this episode, particularly because he was intent on doing the right thing even though I actually thought Emma was a bit short with him with her comment about leather and eyeliner (and his wounded puppy face afterwards) but I can understand that she’s having a rough time. Still, Emma seemed more like a secondary character in last night episode so I’m going to take her actions/words with a grain of salt. Still, Emma’s “You’d really do that?” reminded me a lot to “Going Home”, when she used almost the same words after Regina offered to give both Emma a Henry good memories. I completely agree that “Emma is still not used to people being sincerely kind to her”, even though now she has a quite large family of relatives and friends who care a great deal about her. It was a nice parallel and definitely a beautiful moment. But Hook, and what he wanted to for Henry (and Neal, and Emma, and himself) was great. I was glad to see again the Hook from “New York City Serenade” instead of the one who was ‘glad’ that Emma got her heart broke. And I’m really happy that he told Emma she shouldn’t take Henry back to NYC; really, really happy. Regina (and Robin)… Well, I’m still not convinced and I’m still of the mind that she is out of character. Even though your point about things in the EF being a bit different is a good one, we can’t forget that Regina is quite probably the most guarded character in the whole show, along with Emma. She’s had her heart broken by those she cares for or trusts more times than she can count and I highly doubt that she would give her heart to someone she’s just met, regardless of what pixie dust or meddling fairies have to say. Maybe it was her only option at the time, or maybe there’s more to it than we’ve been shown, but as it is, it did strike me as a certain butchering of her character. And the fact that after the fight she asked RH to keep her heart for a wee bit longer (and somewhat agreed to that drink) while she was ‘heartless’ (and we know what not having your heart does to people, ie. Cora and Will Scarlet) makes me believe that choosing Robin is something she can only do with her brain, but not her heart. At least not yet. There’s also the fact that RH seems a bit shady to me, particularly the fact that he keeps popping out of nowhere, alone, just where Regina is, alone. Maybe I am just reaching, but considering we’re talking OUaT where (almost) nothing is done without a reason, there are many hints that make me distrust him even though he seems like a good guy. I’ve read many theories that range from his use of the colour green and how that’s a colour associated mainly with bad things (not sure I buy this one) to how he’s working for the WW, either willingly (we still don’t know the circumstances surrounding Maid Marian’s death so it is possible that it was caused directly or indirectly by Regina, like many others in the EF, and that RH wants revenge and is going to end up pulling a “Hans”) or unwillingly (the WW has something on him, or has promised him a reset (and to bring back his wife) once she manages this ‘second chance’ she seems set on). I honestly don’t know what to think, which is great because it makes the show even more intriguing, but what I know for sure is that the Regina/Robin development in Storybrooke is nowhere near as promising as the one hinted at during the lost year in the EF, and that’s a pity. I keep waiting, but it keeps feeling rushed to me, more so after last night’s episode. Regina vs Zelena was brilliant but also disappointingly short. I was hoping for a lot more action and sass. I was also hoping for someone to whack Doc in the head after complaining about his car when Regina was thrown quite harshly against it. It’s probably going to come down to Emma and Regina doing magic together and saving the day; again. Like you, I didn’t see Walsh coming at all. I knew he was going to be in the episode, but I never imagined he was going to be Oz; just like I never imagined Zelena was going to be Dorothy (I though it would be the Charmings’s baby). I loved the Emerald City but I don’t think we’re going to be seeing much more of it. There is that episode called “Kansas” though, so we’ll see. First of all, I hope you feel better soon! And I can totally understand your hesitation to give this episode a thumbs-up or thumbs-down, especially given how you feel about Robin/Regina. My interest in the pairing was part of what made me like it (despite the fact that I agree that this episode made the development feel more rushed than ever—but I’m very much a bleeding-heart romantic so I’m an easy sell), so I can definitely see how being skeptical of the pairing would make this episode less than appealing because it ultimately played a big part in the plot of the hour. I do agree with your assessment about all of the mommy/daddy issues starting to get repetitive, but then I remember that Kitsis and Horowitz wrote for Lost, a show in which nearly every character was driven by daddy issues of some sort. That’s why it never surprises me when these familial problems are the root of characterizations on this show, and it’s also why I—like you—appreciate the characters who simply own their evil ways and don’t have repetitive backstories (another reason I liked Pan—yes, he caused Rumplestiltskin’s daddy issues, but he was just a bad seed from the start). I’m really hoping Robin Hood doesn’t turn out to be anything less than a good man because he’s actually one of my favorite fictional/legendary characters, and that would break my heart. I can see why many would be suspicious of him, but I’m actually going to take things at face-value on this one (for now). Also, if Regina is being manipulated by another man at this point, I will want to throw something at the TV (it’s the same reason why I’m 900% sure Hook’s secret isn’t going to really hurt Emma—both of these women have been through enough at this point that to cause them pain again would just be overkill). You know, the thing is that if it were another story, out of the OUaT context or at least out of Regina-as-we-know-her context, I would have absolutely loved it. I am also a hopeless romantic and regardless of being almost ridiculously literal, I liked the heart scene; I liked even more the other scene with Rumpel’s letter. It just baffles me that they chose the (as of yet barely developed) RH as the recipient of Regina’s trust and that they’re making Regina behave in this way because it’s so completely different to the personality and characterisation they’ve been building for three seasons. I’m not really sure I would have liked her giving her heart to Emma either, even though in terms of trust I believe Emma is the one who’s closest to having earned Regina’s. But Emma needed to be present during the showdown and it would have been a dangerous choice (unless it could have been magically guarded INSIDE Emma because her magic prevents others from taking her heart, but I have no idea if that’s even possible in OUaT’s universe). Taking off my SQ-goggles though, I would have understood if Regina gave her heart to Tink (again) for safekeeping. And I would have absolutely loved if she gave it to Snow White, as her less likely choice in order to keep Zelena off the trail (and because the Charmings’s apartment is already being protected), because it would have meant another step in the ever growing relationship between those two and a nice parallel with their scene in the lost year in the EF. I wish I had your trust that the creators are not going to cause Emma and Regina more pain, but I’m just not so sure. Overkill or not, it seems a recurring theme with the show and I’m afraid it won’t stop until the very end when they finally, hopefully, get their happy ending. When I read your idea for Snow being the recipient of Regina’s heart, it was like discovering something I never knew I always wanted. What a beautiful moment that could have been for those two characters, who I always want to see interact more. I really enjoyed your thoughts on Zelena and Regina and their similarities and differences to Cora. In all of those flashbacks we’ve gotten, the show has done a good job showing that Regina wasn’t much like her mother at all, and it took a lot of pain and loss to get Regina to the place where she was the Evil Queen. I don’t want to excuse the things she did as the Evil Queen, but I think that the show has kind of shown “that’s not her natural state, she’s capable of much better” and I think we’re well on the road to restoring her to who she was. Zelena, on the other hand, seems EXACTLY like Cora in a lot of ways. It made me wonder if she would have been WORSE if she’d been raised by Cora. So if she was kinda like that to begin with, I wonder if there’s a path to redemption for her at all, or if she’s a lost cause. I enjoyed the scenes with Hook and Henry too, mostly because I am still a bit disappointed over how Hook and Bae’s relationship was resolved. I was glad that they made peace with each other, but I wished for more, so getting a scene that reminded me that Hook actually did, at one point, offer to act as a surrogate father for Bae (even if it all went wrong, and it was his own fault really), was very nice. Being reminded that Hook lost someone he cared about too and was mourning as well was nice just from a “fleshing out the character” standpoint. It’s also nice to get a glimpse into Henry’s mind, and to see how much him having no family other than Emma that he remembers IS hurting him. One of Henry’s deepest wishes has always been to have his family together, and even though he doesn’t remember specifically who his family members were that he’s forgotten, I think he’s still feeling their metaphorical absence. At his core, he’s a kid who wants a family, and while I don’t want to discount single mothers or the great job Emma has done the past year, I wonder if there’s a part of Henry that does remember that he used to have more. Plus, it’s not a surprise that a kid might feel a hole in them after learning their bio parent is dead, even if he wasn’t close to him. As for Emma – it’s great to see her slowly open up to someone. She’s really had such a tough life and has been abandoned and betrayed so many times that I understand why she is so guarded, which makes the trust she has in Hook actually a very big deal. Emma has been alone for a very long time – when she came to Storybrooke, she wasn’t leaving behind any friends or family. And she’s made friends in Storybrooke, and she found her parents and her son, but she also has to be very aware that these people can all be ripped from her with another curse or a memory spell or another betrayal or some other crazy magic thing. It’s very brave of her to be opening up again at all, especially to a possible romantic relationship. Wow, I’m sorry for the essay. I think you are so right about the show taking great pains to show us that turning Regina into the Evil Queen took a lot of effort because it wasn’t Regina’s default state. Even with the upbringing she had, it took her mother murdering the man she loved in front of her to break her—and even then, she didn’t want to use her magic for evil until it hit her that Daniel could never come back (aka when Rumplestitlskin manipulated her into using her magic for evil). It seems to me that Zelena is much more like Cora than Regina ever was, but she seemed much more emotionally unstable than Cora from the start, which I think will make her a much less effective villain. I LOVED your take on Henry subconsciously knowing he’s missing out on something—on the family he always wanted. I think it’s heartbreaking that all he wants is more than two places being set at the dinner table, when he has this crazy extended family all around him. It’s OUaT once again using dramatic irony at its finest. It’s also why Emma needs to realize that it’s not fair to anyone to take him back to New York. Even if Henry never remembers, he can still be around people who love him, and that’s all he seems to want. I think mother and son need to have a serious talk because I’m not sure Henry’s ever told Emma what he told Regina about wanting to be a part of a big family. I also completely agree with everything you said about Emma and Hook. I think people sometimes forget that there’s always the possibility that a curse could come and take her loved ones away again—or that this curse could be broken and send all of them back to the Enchanted Forest without her and Henry. So having her guard back up makes sense, and it makes her slow, deliberate moments of opening up to and trusting Hook all the more special. He is someone who can put Emma first, and I love that she has someone in her life who is as devoted as we know Hook to be. She needs that, and she deserves it. Thank goodness! I always worry that my rambling is exasperating for people. Yes about Zelena – the thing is, her motive is something that you can see and understand but it’s also such a deeply personal one that I think it makes her a little unhinged. She can do a massive amount of damage because she is so powerful but I think her emotions and instability would get to her in the long run – she’s much more all over the place than Cora or Rumple were! I’m actually expecting her to start coming apart soon, since it seems like she can’t ever hold onto her composure for long around either Rumple or Regina. And I agree so hard about Emma and New York – I think maybe the imagined safety (and imo it is imagined since anyone can come after her there too) is so appealing to her but I think the show is clearly setting her on the path to realizing that having an extended family around you is worth the risk that carries when you’re the Savior and in Storybrooke. And I think that if Emma actually sat and considered it, she’d know that Henry would prefer that too. I also think she wants a family as much as Henry does somewhere inside her, she’s just scared to lose it again so she’s trying to stop that before it happens. And yes about Emma! She’s actually my favorite character so I’m hoping that this is a storyline where she is finally able to open up and let go of her past so she can embrace her family and the future. She’s moved past Neal and their past together, she seems to have accepted that she’s the savior, so I’m hoping the next steps are her opening up and accepting that she wants to be with her family (even if it’s dangerous and might go wrong) and maybe even that she wants to be with someone romantically in the future. She’s come a long way since S1 even without getting involved with Hook. I meant to add this the first time as well – I wonder how things are going to be when Henry inevitably gets his memory back. This episode made wonder, because Henry will have two sets of memories, one of growing up with Regina and one of growing up with Emma. I wonder how they’ll handle that, because I don’t want Henry to just keep living with only Emma. Regina was still his mom. It’s going to be interesting to see how they handle that, especially IF Hook/Emma and Regina/Hood end up happening (and I’m not counting those chickens till they hatch!) too, because that’s probably more “family” than Henry even knew was possible in addition to his multiple grandparents and new (baby) aunt or uncle. I am worried to see how Henry reacts. He wasnt thrilled about being lied to about Neal the first time around, and now Emma is lying to him about his entire life and family. I actually wouldn’t be surprised if Henry turns to Hook for comfort once he gets his memories back. Hook is the only one who hasnt really lied to him about anything, and he is kinda an impartial observer since he wasn’t really involved in Henry’s life before Regina gave him new memories. Yep, and I imagine given the circumstances Henry will be extremely angry, because his father has died for good this time. I really hope this isn’t something that gets brushed under the rug because the show has a larger plot going on, I really want to see if/how Henry deals with all of this. And as for Hook – I would LOVE that, and I think at the very least, Hook is going to be pushing for Henry’s right to regain his memories and his old life back. He already has once, so I imagine Henry will find himself an ally in that, even if he doesn’t know it. I am going to second Red’s feeling conflicted about this episode. The bad parent thing is getting a little old, and I still think the Regina/Robin storyline is falling a bit flat for me. I love Zelena’s attitude in Storybrooke. Its hilarious to me that she puts on such an air of confidence and superiority yet everything she does is fueled by jealousy. I think its pretty clear at this point we are looking at a “time travel” set up here. From Zelena’s question to Rumple about Neal being worth all the trouble (and Rumple saying it was all worth it), to Tink telling Regina that if she had been open to Robin to begin with her life wouldnt be so ?, to Emma struggling with desire to keep Henry in ignorant bliss, there is way too much talk about how the character’s actions have led to pain, and if there is regret (or lack there of) for there not to be some kind of “what if things went differently” scenario before the end of the season. I really enjoyed Tink in Neverland and she had every right to be angry with Regina in 3A, but man, I kinda wanted Regina to slap her in that diner scene. If anyone deserves some space right now, its Regina. I love that you brought up the camera shots between the dirt being thrown on Neal’s gravel and Rumple grieving, because I thought it was such a powerful image. The directing and cinematography has just been top notch as of late and its been adding a great layer of emotion to everything thats happening. I love that Hook’s decision to take Henry out had everything to do with Neal and Henry and himself and nothing really to do with Emma. Hook stepping into Henry’s life at this point could have been seen as a cheap way to get to Emma, but that is clearly not his motivation. Any scene with Hook and a child pretty much just makes my heart break because you can see how much he yearns to have a family of his own. I also like that Hook doesn’t lie to Henry. He’s not even really trying to make up a fake story and I think that’s important and why he was actually able to connect with Henry and probably wont go unforgotten once he does have his memories back. I enjoyed how both Emma expressed fear that telling Henry things about Neal would just sound “made up” and Henry admitting that exact thing to Hook on the boat. Can we appreciate the irony of Emma and everyone essentially making up fake “reality” to prevent Henry from knowing that the fairy tale is actually the truth? I am also glad that Hook is telling Emma what she needs to hear in regards to Henry and his memories. I also think this ties back to the theme of regret vs having a second chance vs having a “do over”. I think its interesting how different the ideas of “having a second chance” and “doing it all over” are. Regina, Rumple, and even Hook to an extent have expressed that they aren’t consumed by regret. They dont want a “do over”, but they have been given second chances. They have owned their mistakes and are living with the consequences. I feel like Emma and Zelena actually have something in common here. They both want do overs and fresh starts, and I wouldnt be surprised if through Zelena’s botched attempt for a fresh start Emma learns the error of her ways. I agree that everything is pointing to a “time travel” set up, including those pictures with Hook with both hands (and different clothes! ;P), Maid Marian alive and well, and Emma in EF garb; this last one makes me hope for a different twist to the concept since she’s ‘current age Emma’ but her clothes aren’t what ‘royalty’ would wear. I honestly don’t know how they’re going to sell it since it’s been drilled into us that Magic has rules and one of them is ‘you can’t change the past’ (maybe even ‘you can’t travel back in time’, I can’t remember the exact wording). I also agree about Tink deserving a slap. Maybe not as much as Doc, but certainly close. And that scene with Neal’s grave and Gold in the cage was incredibly powerful, but what really did it for me was the sound. It made me actually FEEL the weight of the moment and gave me goose pimples. Nothing to add about Hook, he was quite great indeed. I like a lot the distinction you make about wanting a second chance or a do over, and Emma and Zelena having something in common; let’s hope it makes Emma learn the error of her ways, as you said. I can definitely understand the conflicting feelings about this episode. It wasn’t one of my favorites from this half of Season Three, but I think that can be chalked up to the fact that I wasn’t as compelled by the flashbacks as I wanted to be. I like my “villains” either nuanced and sympathetic or unapologetically evil, and Zelena seemed to exist in the middle of those two areas—not sympathetic enough for me to really care about her but still having a “sympathetic backstory” plot. I like her much more now that she’s grown up and grown into her evil, so to speak. She’s more fun this way. I agree that there’s no way time travel is not playing a role in the story now, given how prominent the idea of “do-overs” seemed to be in this episode. I’m hopeful that the lesson that’s learned is that you can’t find happiness from trying to change the past. To quote Lost, “what happened, happened.” It can’t be ignored or altered just because you made mistakes or your life didn’t turn out exactly the way you wanted it to. I think that’s going to tie into the ending of The Wizard of Oz, with Dorothy (aka Emma in this case) realizing she didn’t need to go looking for what she wanted (in this case, a do-over with Henry) because what she had in front of her the whole time is good enough. There are definite parallels to be drawn between Emma and Zelena, and I loved what you said about Rumplestiltskin, Regina, and Hook understanding that a second chance is more important than a do-over because second chances allow you to grow. One final note, I’m with you on the “Take it easy, Tink” bandwagon. If she’s just going to be around in 3B to facilitate discussion about Regina and Robin’s relationships status, I’m going to be mad. She’s too cool to be reduced to that, and it was already annoying in only one episode. I’m curious: do you think Emma is Dorothy in this OUaT reinterpretation of the tale, or just for the scene/moment you talk about linking to the end of The Wizard of Oz? I had convinced myself that Dorothy was going to be the Charmings’s baby, but then we got Zelena being the one brought to Oz by a tornado so I thought that meant it was her… But only parts of the character are there so now I’m starting to think that maybe Dorothy is more an ideal than one specific character. I’ve been thinking about this ever since we found out that the Wicked Witch was the next villain. I know that Zelena has the tornado, the silver slippers, and the desire to escape the “ordinary” life she led for a better life—and all of those things point to her being Dorothy. But I really think Emma’s arc in 3B is going to mirror Dorothy’s discovery that “there’s no place like home” and that she doesn’t need to run away from her life because she has people in her life that love her (but in Emma’s case, it would be running away from a magical life to an “ordinary” life). So I’m leaning towards the idea that there won’t be one set “Dorothy” embodiment in this version of the Oz story, but parts of her story will be thematically incorporated throughout the rest of this season by various characters. Hello again I’ve been travelling the last couple of months so I haven’t been able to add my comments on OUAT but I’m back now! I am loving 3b so far & I really love the wicked witch – she wants revenge so badly that I think it makes her really dangerous – she doesn’t seem the care what the cost is as long as she kills Regina – I can’t wait to see where the story will end. I ‘m still holding judgement on Regina & Robin Hood – the actors have good chemistry but I think part of my problem with it is there’s no real tension from an audience perspective we’ve been told already they’ll fall in love so I think it takes away the suspense whereas we still don’t know for sure what will happen with Emma & Hook (although I totally am a CaptainSwan fan). I really wasn’t expecting Regina to give robin her heart – it seemed too rushed to me but I guess Zelena won’t expect it either. Welcome back, Joan—I’m happy to have you back! Your comment about the lack of tension between Regina and Robin is interesting, and it makes sense to me. I thought there would be more tension between Regina knowing Robin is her “soul mate” and actually choosing to accept and embrace that, but the story kind of jumped straight to her giving him her heart. I understand that Zelena probably wouldn’t think to look for it with Robin unlike if Regina left it in the care of others in Storybrooke, but it did feel like a fast development for me to watch as a viewer. I didn’t mind because, like you said, both actors have great chemistry, but I do want to see more of their interactions in order to get a better handle on this story from Robin’s perspective and not just Regina’s. Back at Zelena’s house Regina had a déjà vu moment with Robin. Despite not being able to remember the past year, on some subconscious level I think she knows that she knows him. That makes her a little more comfortable with him than she normally would be. Leaving her heart with him during the fight was almost like a test run. If he were out to get her, he could have easily delivered it to Zelena, crushed it or used it to control her. He didn’t, he protected it and he was willing to simply give it back when she returned. In her eyes, I think that was enough to prove that he was genuinely on her team. Also leaving her heart with him is just so not something Regina would ever do, to the point that no one would ever expect it or be able to guess where it is. Zelena has Rumple and while I’m not sure if the dagger has the control over him to extract info like that, if it does, even he would never think to look there. While there was a romantic aspect to her doing it, I think it was done from more of a logical standpoint. I find it entertaining that Zelena is going to all this trouble to basically steal Regina’s life without first getting any insight into what Regina’s life has been like. Zelena’s reaction to her father getting angry and telling her what he told her, seemed like he was telling her that for the first time and she couldn’t handle it. While that rejection is really sad and difficult, I can’t even begin to imagine how she would have handled Cora, the woman was a sociopathic, abusive, heartless (literally), power hungry, powerful witch. She came back to the Enchanted Forest to rip her own daughter’s heart out (she changed her mind, but still). As Regina said back in the EF, Zelena was lucky to escape her. It will be interesting to see how that plays out. Part of me wishes they hadn’t killed Cora off, her presence during this would have been awesome. The Emma/Henry storyline irks me. I feel like her not wanting Henry to have his memories and just wanting to take him back to New York is incredibly selfish and she’s doing it to benefit herself more than Henry. She gave him up, found him, fell in love with him and wants this fake reality to be the real reality. She’s not taking into consideration that Storybrooke is his home, the people of that town are his family who raised him and that that is his life. She’s okay with it just being the two of them, not realizing that maybe he’d like and possibly needs more. What she’s doing now is actually comparable to what Regina was doing in and pre season 1. Making him believe a false reality wasn’t fair to him when Regina did it and it’s even less fair now that Emma is doing it. Henry always wanted honesty from Regina and Emma. He wasn’t unhappy in Storybrooke, he was unhappy that his mothers were feuding. That’s not the case anymore, Regina, Emma & The Charmings are practically buddies now. The longer Emma allows him to go without his memory, the more irritated I feel by it. I have to disagree about your “logical standpoint” statement. I hardly think it’s logical to give your heart to someone you barely know, déjà vu notwithstanding. They’ve just find out that one of the new inhabitants of Storybrooke, the apparently sweet midwife who was helping Snow with her baby, was in fact the Wicked Witch; I really doubt it’s the time for “test runs”, particularly with something as important as Regina’s heart. You said it yourself, “he could have easily delivered it to Zelena, crushed it or used it to control her” which is precisely why this move is not logical at all; Regina put herself in danger by doing this, and by extension Henry and the whole town. If the aim was for nobody to guess where her heart was, she could have easily hidden it herself and she would have been the only one to know. In addition to what you said about Zelena not having “any insight into what Regina’s life has been like”, there’s also the fact that Cora abandoned her well before Regina was even born which makes Zelena’s jealousy even more ridiculous. I really want to know why Cora sent her to Oz in the first place, and who her real father is. I agree completely about Emma/Henry, and how it’s a parallel of what Regina was doing in S1. I wonder if Henry is going to treat Emma the same way he treated Regina once he discovers the truth, but I have hope that Emma will realise that taking this part of Henry’s life away without even letting him have a say in the matter is wrong. I also hope Emma and Regina talk about this during their upcoming ‘magic lessons’, because Regina certainly deserves to know about Emma’s plans for Henry. Thank you so much for the comment! I definitely agree with your opinion that Regina experienced a déjà vu situation with Robin at the farmhouse, which made her feel drawn to him in the same way that Snow and Charming were drawn together back in Season One when they were cursed. I want to see just how far their relationship progressed back in the Enchanted Forest because I think that would explain a lot about their instant connection here beyond just the whole “soul mates” thing. After you mentioned wishing Cora was around for all of this Regina/Zelena fighting has me missing her character more than ever. Zelena won’t ever believe that she was actually better off without Cora’s abuse and manipulations, but it’s the truth. Regina definitely got the thicker skin out of that pair of half-sisters, but I wonder how much of that actually came from growing up under Cora’s oppressive thumb. I share many of your frustrations about Emma and her desire to take Henry back to New York after Zelena is defeated, but I do think part of her reasoning is sound. Storybrooke could disappear again at any moment, leaving Henry (and Emma) behind again, and it could happen as soon as Zelena is defeated if it breaks the curse that sent them back there. I think part of Emma’s desire comes from her long-held belief that it’s better to have no attachments than to get attached to people and have them leave you. “Family” and “home” are still difficult concepts for Emma to understand after being without them for so long. But Henry wants that, and Emma needs to know that he wants that. I wonder: If Emma knew that Henry wanted more than just two places set at Thanksgiving, would she still be so insistent that he goes back to New York? Emma may like the idea of her do-over as a mother, but she’s not Henry’s only family—she’s not even his only mother. I hope this upcoming episode features Emma and Regina talking about Henry’s future because Regina deserves a say in what’s going to happen to her son. And I also hope that someone (Hook?) reminds Emma that Henry wouldn’t be the only one to miss out on important relationships if they go back to New York; Emma would be depriving herself of people who love her, too. Carlyle is so amazing! I wish they’d just tell us who Zelena’s father is already. And Hook is such an amazing character! I agree with you on all of those points! I especially can’t wait to find out who Zelena’s father is, and I’m hoping we don’t have to wait much longer. Hi! I know I’m really late to this party, but having bing-watched the entire third season this past weekend, I was really feeling a need to discuss/interact with other fans about what happened, especially in 3b. I find your episode dissections be so wonderfully balanced (in terms of giving fair analysis to all the characters) and eloquently written, and after having wadded through obsessive fangirl babbling on youtube and more generic media reviews trying to sort out what I think about each episode, it has been really refreshing to read your take. I totally agree with everything that’s been said so far about the Hook/Emma dynamic for this episode, although I did want to mention one of my personal favorite moments. In the diner, right after Emma makes the (incredibly snarky) remark about eyeliner and leather conditioner, I was absolutely blown away by the way Colin played his reaction. It was such a small moment, and he didn’t even say anything, just stared at her, but it conveyed so much (to me at least). I feel like everyone else forgot (or weren’t aware) that Hook and Neal had their own relationship, and no one seems to be at all concerned about Hook’s grief over his death. And, while that is fitting with Hook as a character (him not really wanting people to fawn all over him), I just really loved in the moment you get this sense from him that Emma’s remark stung because she was diminishing his own process of dealing with Neal’s death. It was also rather telling that he (once again) let her nasty remark slide, although you do get a little hint of attitude in the way he responds with the fact that he knew Bae as a boy. I’m really looking forward to reading through the reviews of the rest of season 3 (especially your take on “The Jolly Roger” because, let’s be honest, Colin was phenomenal) and for season 4 to come! Your favorite moment is such a great one because it’s so subtle. It broke my heart to see Hook having to deal with his grief alone, but I thought Colin O’Donoghue played it perfectly. Like you, I was struck by the moment when Hook told Emma he did know Bae as a boy. O’Donoghue struck the perfect balance in that line reading between showing a bit of backbone and biting his tongue because he knew Emma was still processing her grief in her own way, too. I was so happy to see Hook and Henry genuinely bond later in the episode while talking about Neal because Hook as a character needed that moment to talk to someone who would listen about his grief—even if Henry couldn’t understand it fully. It established a nice foundation for their relationship, which I can’t wait to see more of as the show goes on.